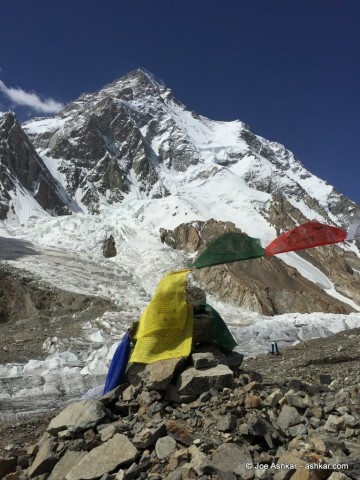 It’s been 8 days since we’ve been back from our last rotation to K2 Camp 2+ and have been patiently waiting at Base Camp for our Summit window. The forecast doesn’t look good and climbing conditions on the mountain are worse. Earlier today, the super strong Swiss Team led by Mike Horn abandoned their Summit attempt and turned back from Camp 2 on the Cesan Route. 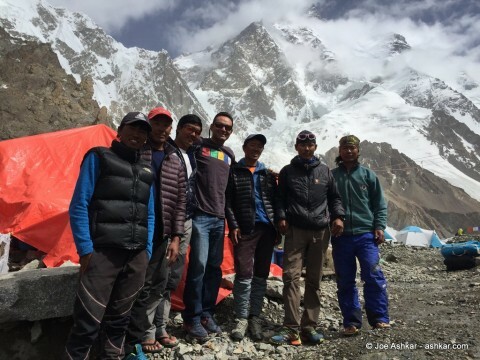 The 7 Summits group made a go for it earlier this morning but once they arrived at Advanced Base Camp to recover their Crampons, Ice Axes, Harnesses and other climbing gear, they couldn’t find their tent; it was buried 5 meters (17-feet) deep from an overnight avalanche. they worked tirelessly for hours and still couldn’t recover their any gear. Our Sherpa team tried to carry a load to Camp 3 but their attempt was thwarted at Camp 1 and couldn’t progress further due to deep deep snow and rock fall danger. Unfortunately and sadly, our lead Sherpa Kami was hit by a rock and appears to have three fractures inn his arm. The route between ABC and C1 is a sight to be seen: water streams running down alongside avalanche debris and rock fall. A gigantic boulder was seen rolling down all the way from C1. All the fixed lines between ABC and above appear to have been damaged and rendered unusable. Bad and sad news all around today. A very depressing day. The forecast is showing bad weather for the next 7 days and we still don’t have fixed lines above C3. It’s very possible that we might not even get a chance for a Summit attempt this season. Next Post: K2: K2 says NO!